The Eagles finished a preseason game with a bad taste in their mouths for a third week in a row after a poor performance, particularly on offense. The offense was shut out by the Cleveland Browns in a game where they finished 3-of-12 on third down, turned the ball over four times (forcing just one on defense), and allowed seven sacks. The total of penalties dropped to just four after reaching double digits in each of the last two games, but sloppy play was prevalent throughout the night.  This is by no means a reason for you to panic as an Eagles fan. This is the time of year to work through these kinds of things, particularly in today’s NFL. You’d much rather see a team operating at high efficiency on both sides of the ball. Let’s dive into the tape and see some of the bright spots from Thursday night as well as some of the areas where things didn’t go so well, starting on the defensive side of the ball. I find it hard to not start things off with Fletcher Cox, who had another sack against the Browns. No. 91 has been outright dominant during his time on the field this summer as he continues to cement himself as one of the best defensive linemen in the NFL. For this play, we’ll look at Cox’s power and technique in the trenches, but be sure to take note of the coverage on the back end as well. Off play-action, Baker Mayfield is hoping to hit either Rashard Higgins or David Njoku down the field on a ‘shot play,’ but the Eagles are having none of it. Cornerback Ronald Darby locks down Higgins, safety Malcolm Jenkins blankets Njoku, and safety Rodney McLeod patrols the post which prevents Mayfield from delivering the football. The rookie hesitates, and Cox gets home for the sack. The All-Pro tackle clubs right guard Spencer Drango and tosses him aside with ease, getting himself matched up with right tackle Chris Hubbard. The free agent signee finds himself to be no match for Cox, who bull-rushes him back into the pocket before attacking Mayfield’s throwing arm and nearly forcing a turnover by getting the ball to the ground. It was a great individual effort by Cox that started with tight coverage on the back end. Staying with the defensive front, one thing that stood out to me from Thursday night was the amount of extra pressure Jim Schwartz sent on third down. If you remember from the last two years, the Eagles have not been a high volume blitzing operation. I don’t think that will change this year, but it was cool to see some of the variety in the pressure scheme against the Browns. Here are some great examples of what I’m talking about. On the first third down of the game, the Eagles send an overload pressure at quarterback Tyrod Taylor. The pressure comes from the left side of the defense which means that Derek Barnett has to drop from the right side. Watch the second-year defensive end drop back into coverage, then drive on the throw in front of him, and help bring the receiver down short of the first-down marker. That’s a great job by Barnett, who was asked to do things like that at times during his college career at Tennessee. Later in the game, we see something that I do expect to see a lot of this fall, and that’s the "speed" package up front for the Eagles with three defensive ends on the field and Michael Bennett lining up inside along with Cox. Bennett has done this throughout his career, and the Eagles did this a lot last year with Brandon Graham on the inside. Bennett is also great at executing his assignment on long stunts, which is precisely what he does on the second play, hugging the corner in a three-man game and getting home for a big hit on Mayfield on third down. We also saw a couple of Cover 0 blitzes from Schwartz’s unit. A Cover 0 blitz is an all-out pressure, meaning you are sending more defenders than the offense can block. This means all of your coverage players are on an island with no help in the middle of the field. The Eagles disguise this pressure well, and when they show blitz late in the pre-snap phase, the running back does not account for Jordan Hicks coming inside. Hicks flies into the backfield and takes Taylor down for the sack. The Eagles show a very similar pressure look on third-and-long later in the game. It looks like it could be another Cover 0 pressure, at least that’s what Schwartz wants you to think. Seven defenders are at the line of scrimmage, but three of them drop out at the snap of the ball, two of them into Mayfield’s first throwing lane. The rookie looks confused, begins to run around, and is sacked late in the down. I’m excited to see what new wrinkles are revealed in the Eagles' defensive attack this fall. One player who doesn’t get enough love is linebacker Nigel Bradham. The veteran linebacker showed off his toughness, instincts, and ability to play both the run and the pass at a high level on Thursday night, as you can see in the trio of plays above. On the opening drive of the game, the Browns marched down the field and got inside the 2-yard line with four shots at the end zone. Cleveland chose to throw on all four tries, and Sidney Jones was involved in the action on the first three of them. Let’s see how it played out. Jones worked through contact and was there in coverage to defend a clean throw on first down. That wasn’t as impressive as the two plays that followed, however. On second down, Jones did an outstanding job of attacking the point man in this stacked receiver set, refusing to get "picked off" in coverage and fighting his way to the catch point to get a pass breakup on the goal line (this is similar to the famous Malcolm Butler play in the Super Bowl between the Patriots and Seahawks). On the next play, feeling another rub route on the goal line, Jones jammed the No. 2 receiver into the No. 1 receiver, disrupting the timing of the routes and forcing an incomplete pass in the red zone. The Browns would throw again on fourth down for an incompletion to come away with no points. While Sidney Jones got the start in the slot and made those plays on the goal line, rookie Avonte Maddox made plays of his own and nearly became the hero of the game with this fourth-quarter interception. This was not all on Maddox, however, as second-year linebacker Nathan Gerry did a great job in underneath zone coverage of intersecting that shallow crossing route, preventing the receiver from reaching for the football, and allowing Maddox to pick it off for a big play the other way. Maddox’s versatility to come in and give the team two reps at safety at the end of the game was good to see as well for the young defensive back, who was also active on special teams against the Browns. Defensively, the biggest issues came in the run game. There were too many missed tackles downhill and too often the ball carrier got to the edge uninhibited. The run fits must be better in Week 1 against the Atlanta Falcons, one of the better run teams in the NFL. Offensively, it was not a good night. There’s no way around it. The first-, second- and third-string units could not get anything going in Cleveland. I opened with the defensive line, so I’ll shift my focus to the offensive line to begin the evaluation of the offense. Halapoulivaati Vaitai struggled mightily against the Patriots last week in New England. There was consistent pressure both with the starters and the backups in the game regardless of who was lined up against him. After reviewing this week’s film, I would say he was not as bad and there were plenty of positives to take from the performance. Keep in mind that Vaitai was matched up with Myles Garrett, last year’s No. 1 overall pick and one of the most naturally talented edge rushers in the NFL. The players he matched up with last week with the Patriots are nowhere near as talented, and I thought Vaitai battled with Garrett up until his injury. Here are some of the good and some of the bad snaps from Vaitai’s night. Allowing defenders to get into his chest was a concern for Vaitai back in college. When he gets into trouble in the NFL, that’s usually the primary cause of it in the NFL. It’s something he’s continuing to work through. I’m still not at the point where I’m panicking about Vaitai. Remember that the third-year player has been getting the majority of the reps this summer in team sessions, not just with the starters (with Jason Peters on the sideline) but also with his fellow second-stringers so that he doesn’t miss any of the timing with that unit. Vaitai obviously came up big for this team down the stretch last year, and he looked as strong as ever during Training Camp. He will be ready if he has to play during the regular season. I’ve been so impressed with Isaac Seumalo in the preseason games this summer. Yes, he’s had his issues snapping the ball as he makes his transition to center, but his versatility cannot be questioned. Because of various injuries, Seumalo stepped in at left tackle, left guard, and center on Thursday night while also serving as a third tight end in some jumbo packages. He’s almost never on the ground and showed the ability to hold the integrity of the pocket in pass pro. Don’t count this kid out yet! Speaking of young, intriguing offensive linemen, Jordan Mailata looked great on Thursday with the third-team unit. He was going against other reserves from the Browns, but if you’re looking just at traits you can’t help but be impressed with the kid playing in his third football game ever. Mailata handled speed, power, stunts, a variety of rush moves and more like a kid who has played football his entire life. With his combination of size and movement, along with his personality off the field, fans should be excited about Mailata’s future in Philadelphia. There were a handful of other individual blocks that I felt the need to share. Look at the effort here from Jason Kelce, Zach Ertz, and Lane Johnson (as well as Brandon Brooks) on this trio of plays. We won’t see the starters next week against the New York Jets, but it was good to see them compete like this against the Browns. One skill player who continues to shine is DeAndre Carter, who made plays as a receiver and as a returner on Thursday night. Carter is fighting tooth and nail to get onto this football team and is one of the best stories of camp. I’m excited to watch him perform in the preseason finale next week.